World Rugby (formerly IRB) has recognised the requirement and the lack of validated pre-hospital based courses which specifically addressed the needs of collision sports, particularly rugby union. With rugby evolving into a more global sport, the physical and mental demands of the game also increases significantly. While catastrophic and life or limb threatening injuries are not common in rugby, it is essential when they do occur that the attending personnel are appropriately prepared and trained for such incidents. 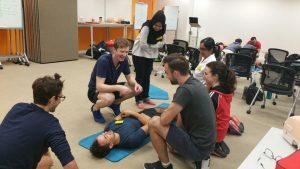 The Level 1 First Aid In Rugby (F.A.I.R) course is hosted by the Singapore Rugby Union, in conjunction with World Rugby. The one-day course is suitable for people with little or no medical background, who wish to be trained in basic sports first aid with a concentration on rugby. These include coaches, teachers, parents, sports officials, players and others who may be asked to respond to an injured athlete at a sports event or during training. The course is conducted by local and overseas faculty with experience in medical first aid, pre-hospital immediate care and sports medicine education. For Course dates and applications click here. World Rugby – endorsed certificate for successful candidates. Course fees must be paid before the commencement of the course. Participants who have not completed payment will not be allowed on the course. The course is non-profit making and delegate fees will match the true costs of running and maintaining the programme. The Singapore Rugby Union allows payment via cash or cheque. Please make all cheques payable to the Singapore Rugby Union with your application form. Course fees will NOT be refunded if a cancellation is made within two weeks of the start of a course. The course fees will be held over to the next available course in exceptional circumstances and certified illness. This will be at the discretion of the course director and the Union.